(Newser) – A North Carolina man was arrested Thursday after allegedly chasing a woman into a karate dojo—where he ran into a little trouble, CNN reports. 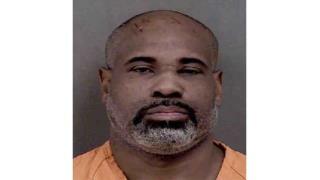 Seems August Williams, 46, went into the Bushiken Karate Charlotte Dojo in Charlotte just as the chief instructor was cleaning up: "There were still some kids in the dojo being picked up by parents and a couple of adult students cleaning up when a young lady came through our doors and stated that someone was trying to harm her," says Randall Ephraim. "Shortly afterward, a big male entered the building." Ephraim says he first thought the visitor was there about classes, but Williams said he wanted the woman, and "she insisted that she did not know him and [he] tried to kidnap her." There is no cure for stupid nor is there a vaccine against it. That woman is lucky the dojo was there with capable people inside, and that she chose to run into it, otherwise she would almost certainly be dead.